This special straight thread connector is a 1/2″ flare tube fitting by 1/2″ British Standard Parallel Port (BSPP) thread. This BSPP fitting was manufactured with a bonded seal. The bonded seal integrates the steel plated retaining washer and the rubber o-ring offering a one piece solution. The TX-8-GC-BSPP has a groove machined on the face of the hex and the o-ring seal seats flat against the opposing flat surface. There are two types of British Standard Pipe Threads. There is the BSP/BSPT which refer to the same thread standard which is for a taper thread. The BSPP standard refers to a straight thread vs the taper thread of the BSPT. BSPP stands for British Standard Pipe Parallel thread. Popular in Europe including the UK as well as parts of Asia, the BSPP straight thread fitting seals with a bonded seal to accomplish the seal. The bonded seal (similar to an O-Ring on an SAE straight thread) is compressed between the shoulder of the fitting and the face of the female thread the fitting is mating with. The BSPP fitting and bonded seal is designed to work with a retaining ring and does not require any additional sealing compound for sealing. 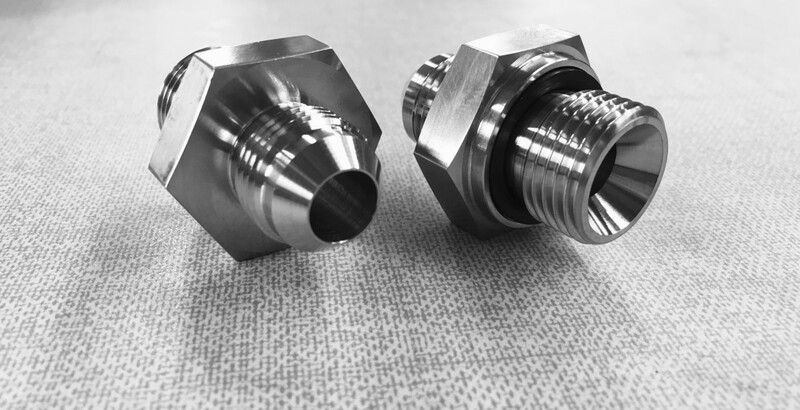 The increase of equipment manufactured in Europe and Asia now in the United States is increasing the demand for British Standard parallel and taper thread fittings. See our technical brief which covers the different type of taper threads that OmegaOne produces.